That came from a friend in an email May 4, or a week after the tornado blasted us on May 27, 2011. They added, “so glad you are not missing,” to which I add, Amen! Normally I devote this little column to something historical, but, with the leave of the editors, I’d like to get personal. I am a survivor of that monster. My house, one technically-minded friend emailed me, was about 1100 feet from the tornado. 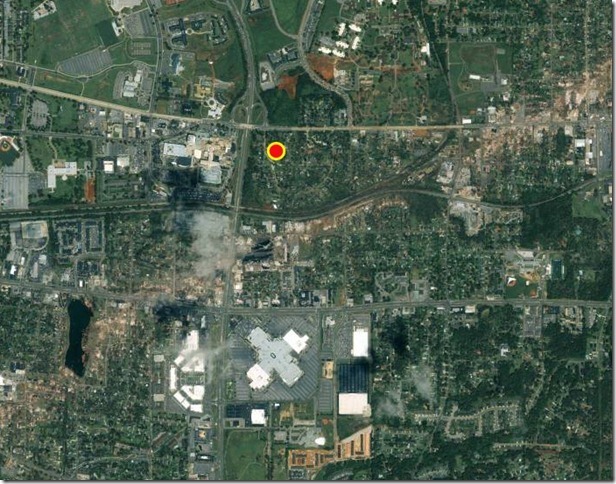 He even sent me a GeoEye satellite image of the tornado track. It is the brown stain running from bottom left to top right. My house is the red dot. My friend didn’t mention if we were 1100 feet from the center of the tornado, or maybe from the northern edge. It did make a difference I discovered. I was listening to James Spann on Channel 5 just before 5 p.m. like so many of us, trying to figure out where it was going. A friend I work with, Howard Jones, called me up. They had lost power and live in Northport and he wanted to know what was going on. I told him to hunker down. I still had television. A small twister was headed his way. Howard tried calling me back. By that time the F4 had roared by and we lost everything—power, telephone, cable, and, I must add, a lot of our innocence. I didn’t have any idea how many tornados were out there. My wife Louise was down in the basement laundry room with all the dogs she could round up. The St. Bernard, Mikey, stayed in my motorcycle shed. That was his safe spot. We have no idea where Boo Boo Kitty rode out the whirlwind, but she did also. Then Spann picked up the funnel cloud and I watched, fascinated by the horror and power. I saw what looked like a car thrown out of the top and it slowly drifted down. A car? This was a monster if it could pick up cars and throw them around like toys. I kept running between the t.v., Spann, and my front porch, determined to get a track. Then I heard the sound. I started like a hum and picked up into a roar, like being inside a gigantic electric dynamo. “Louise, Louise! Come up here!” I called, wanting her to hear this. I could barely keep the door of the laundry room closed as the wind shrieked through the house, howling like some monster from hell. Then it was over. I don’t think it was more than thirty seconds. I stopped searching the sky and instead looked down. No wonder it was so light. Our giant oaks were lying on their sides like dead men. I looked down the street into my neighborhood, The Highlands, and it looked like lumberjacks had come through and clear cut. I could barely see homes through the giant branches and leaves, some draped across the street, some in yards, a lot smashed into homes. Power lines and trees and homes all tangled in huge messes. Then the sirens started to wail. They didn’t stop all that evening or night. Something really bad had happened. Most of us know the rest of the story. Next morning, before the police, before the National Guard, before the dozens, then scores, then hundreds, and finally thousands of my fellow citizens walked or rode into our blitzed neighborhoods to help, I stood in the driveway at dawn. I must have appeared shell shocked, for a two man national ABC camera crew on foot stopped by to film and talk with me. I started to babble on about the sound, the fright, the…when one said, “wait, don’t tell us yet, we’ll be back,” and they left. They interviewed us both, and later we heard from friends in California, Washingon D.C., Mississippi. “We saw Louise on television, with the bug in the back!” Her red VW convertible with black dots, the Ladybug, was crushed by a huge tree, and Louise was still in shock and horror, not so much from the totaled car, but from hearing of so many dead, so much devastation, and she cried as she spoke. We had no idea. This happened to people in Arkansas, or Mississippi, or Tennessee and one watched it on t.v. and clucked and sympathized with their plight. But around the corner? Down the street? Just up the road in Alberta City, that nice little community struggling to become something more than left-behind by prosperity? The love and care poured out by friends, neighbors, and strangers overwhelmed me. Our pastor, Gil McKee of First Baptist, said he heard of a power crew from Michigan, like so many others from more than a dozen states, in town to help us rebuild the grid of electricity so foundational to our modern lives. The shock of that afternoon, and the grief for the lost and hurting, is slowly subsiding in my soul, but it will never go away. Nor will my pride in the people of my city and my community and my nation who folded in around us. Now to rebuild and make what we have even better.